An allergy exists when one’s immune system responds abnormally to a usually harmless substance. For most affected people, allergies first appear during childhood. 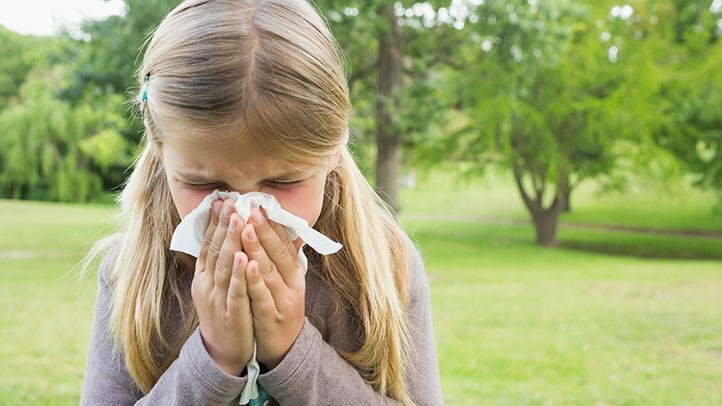 Though any child may develop allergies, there are factors that increase the risk. Family history plays a large role in a child’s tendency to have an allergy. In addition, hormones, stress, smoke and other environmental factors can play a role. Food allergies—Common ones in children are peanuts, eggs and milk. Children sometimes outgrow these allergies. Food or medication allergies can cause cramps, vomiting, swelling in the mouth or throat, itchy skin, wheezing and hives. Insect stings often cause swelling, itching, redness and pain. The previous examples are the most common allergies and symptoms, but remember that any number of substances can cause allergies, with a large variety of potential symptoms. The most severe reaction to any allergen is anaphylaxis. This can occur for any allergy, but children with peanut or insect sting allergies may be particularly vulnerable. Anaphylaxis is a life threatening reaction, with symptoms such as full body hives, difficulty breathing, tingling of the skin and unconsciousness. This type of reaction occurs almost immediately after exposure to the allergen, and requires emergency medical care. Watch for abnormal symptoms in your child, particularly if they occur after eating or taking medication, after being stung, or when exposed to potential allergens indoors or outdoors. If you suspect your child has an allergy, see a doctor. A doctor can perform skin, blood or other tests to identify the potential allergy. If your child is diagnosed with an allergy, learn as much as you can about it so that you can adapt your family’s lifestyle to avoid allergy triggers. If your child is prone to severe reactions, alert family, friends and your child’s school or child care provider, and have your child wear a medical alert bracelet at all times.